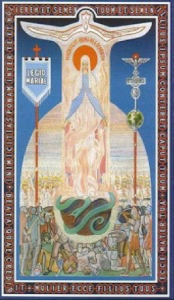 Founded by Frank Duff in Dublin Ireland on September 7, 1921, the Legion of Mary is now the largest apostolic organization of lay people in the Catholic Church with well over 3 million active members in almost every country of the world. The object of the Legion of Mary is the glory of God through the holiness of its members developed by prayer and active co-operation in works of Mary and the Church. Active Members – attend a weekly Legion meeting, perform works of service (about 2 hours a week), and recite a Legion prayer daily. Auxiliary Members – pray daily the rosary and the Legion of Mary prayers (the Tessera) which support the efforts of the active members. They do not attend a weekly meeting or perform works of service. Our Lady Queen of All Saints Praesidium meets on Wednesday evenings, 7:15pm, Room 6L in the parish center. Guests are always welcome and may go on one of the work assignments with an experienced member. Patricians meetings (talks on matters of apologetics with time for Q & A) Patricians meet monthly at 7:00pm; check Bulletin for date, location, and topic.